The healing of Bartimaeus concludes Mark’s account of Jesus’ public ministry outside of Jerusalem. Jesus’ days are numbered. Jesus passes through Jericho, a city approximately 15 miles from Jerusalem, undoubtedly accompanied by many other pilgrims on their way to the holy city for Passover. Many beggars commonly lined these routes, particularly during the days before and after Jewish festivals. Jesus’ question, “What is it you want me to do for you?” (10:36, 51), ties together last week’s reading about the disciples’ lesson about servanthood (read my sermon here) and Bartimaeus’s healing. Clearly Bartimaeus has heard of Jesus of Nazareth, his compassion and his miraculous power. Bartimaeus refuses to be discouraged by his lowly position, his inability to find Jesus easily, or by the rebukes of the crowd. Bartimaeus calls Jesus “Son of David,” an unmistakeable messianic title (2 Samuel 7:4-5, 11-16; Isaiah 11:1), and seems confident that Jesus will in fact have mercy on him. Bartimaeus seems able to see Jesus more clearly than do the disciples (John 9:1-41). 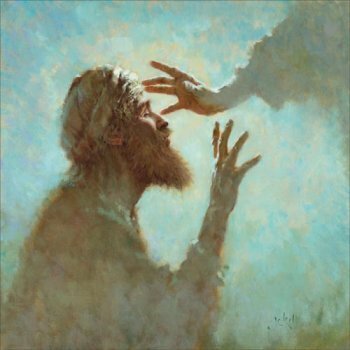 The simple request of Bartimaeus for restored sight – “My teacher, let me see again” (v. 51b) – is in sharp contrast to the request of the two disciples for preeminence among Jesus’ followers. it would seem that Bartimaeus, even in his blindness, has better sight than those among Jesus’ inner circle. As soon as he asks for his sight to be restored, Jesus assures him that his faith has made him well again. As testimony to his faith, when Jesus calls Bartimaeus to him, Bartimaeus leaves his cloak behind. As a blind man, he could not expect to find it again. But as a person who can see, he would be able to locate his cloak. The faith of this man is characterized by his confession of need, his persistence, and a genuine conviction that Jesus could and would heal him. Thus the man receives his sight, and can join the festive pilgrim crowd and follow Jesus on the way to Jerusalem. Compare James and John’s request of Jesus (from Mark 10:35-45) with that of Bartimaeus. How would you describe the disciples’ spirit? In what ways are you blind to Jesus? How would you describe Bartimaeus and his actions in the Gospel passage? What would it be like to be blind and then have your sight miraculously restored? The crowd tried to ignore Bartimaeus and to keep him quiet (Mark 10:48). What are some of the needs of the world or of your own community that are being ignored and need to be brought forward for healing? What role do you think the Church should have in bringing such issues to light? A form of Bartimaeus’ initial cry to Jesus has become known as the Jesus Prayer: Jesus, have mercy on me, a sinner. What makes his cry an excellent model for prayer? As a recipient of God’s grace through Divine healing, Bartimaeus became a follower “on the way.” What experiences in your own life have led you to a deeper commitment to Christ? This entry was posted in Ordinary Time and tagged Bartimaeus, Discipleship, Faith, healing, Healing the blind near Jericho, Lectionary, Mark, miracles. Bookmark the permalink.